Architectural style is defined as a definite type of architecture, distinguished by special characteristics of structure and ornament. 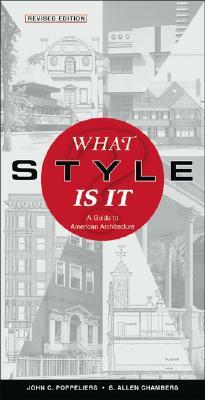 This revised edition of What Style Is It? includes new sections on Neoclassical, Romanesque and Rustic Styles. It also provides more examples of how pure styles vary by geographic region across the US. * Includes an added guide to using the Historical American Buildings Society online catalogue of more than 30,000 historic structures, giving access to more than 51,000 measured drawings, 156,000 photographs and more than 30,000 original historical reports. The late JOHN C. POPPELIERS was head of the Historic American Buildings Survey (1971--1980) and coauthor of the previous edition of What Style Is It? S. ALLEN CHAMBERS Jr. is an architectural historian based in Washington, D.C., and former historian with the Historic American Buildings Survey. An active contributor to the historic preservation field, he serves on the boards of the Foundation for the Preservation of Historic Georgetown and the Tudor Place Foundation.